The peak of the Atlantic hurricane season is upon us. Although the season officially began June 1, the annual peak falls between August and October, when nearly 80 percent of the storms occur. In North Carolina that means being prepared for emergencies — including assuring the safety of your pets and other animals. Just last September, Hurricane Matthew struck North Carolina with deadly force, taking 26 lives and causing $1.6 billion in damage. Fortunately, there are stories of survival as well. Many of them are remarkable. 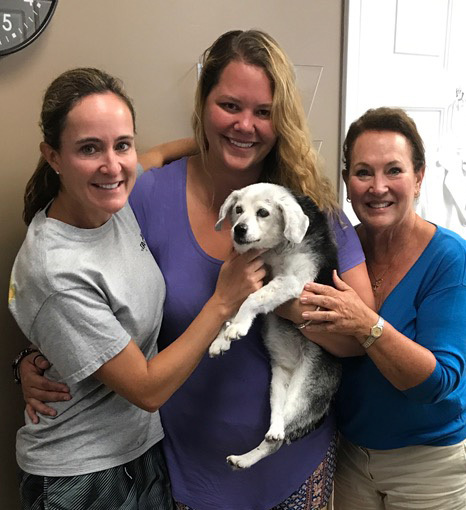 One such story belongs to Maggie, a little dog who was a survivor of an even more catastrophic storm, Hurricane Floyd, which struck North Carolina in 1999 causing devastating flooding. Maggie, a beagle and miniature poodle mix, lived to the extraordinary age of 23 and endured for 18 years after being rescued, all as part of the NC State College of Veterinary Medicine family. Nobody knows for sure how Maggie came to be rescued, but her connection to the CVM started with Sloan Dupree, now Sloan Dupree Turner, Class of 2000. She was a fourth-year vet student when Hurricane Floyd struck and helped provide treatment for Maggie and the more than 400 animals seen by the NC State Mobile Field Hospital. The field hospital, staffed by student and staff volunteers is run by Kelli Ferris, general practice clinical assistant professor and director of the community-campus partnership. 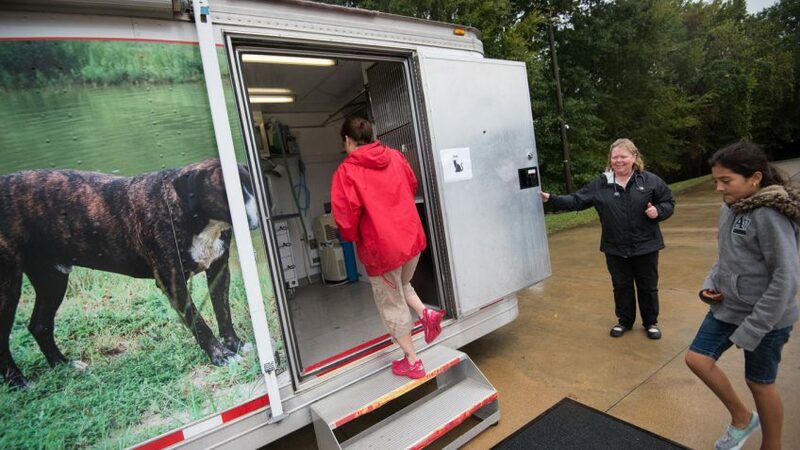 The mobile hospital primarily serves rural areas of North Carolina and has operated entirely on donations to the North Carolina Veterinary Medical Foundation since 2004. Also working with the field hospital as a volunteer was Sloan’s mother, Layne Dupree. The Duprees have a history of dedication to animal welfare. They were charmed by Maggie’s puppy-like appearance and sweet nature, and when no owner stepped forward to claim her, Layne adopted her as a Christmas gift for her 8-year-old granddaughter, Victoria Riggs. It took some time for Maggie to become adjusted to her new life. Left to right Sloan Dupree Turner, Victoria Riggs, Class of 2020, Maggie and Layne Dupree. Keeping the family connection with NC State alive, Victoria is now a member of the class of 2020 at the CVM. Inspired by her aunt, who has a radiology practice in Wilmington, she is also looking toward an eventual career as a radiologist. “I’ve been shadowing her since I was 16,” she said. The love of animals runs in the family, she adds, starting with her grandmother who often opened her house to animals. That experience lead to Victoria majoring in animal science and genetics as an undergraduate at NC State with an eye on eventually going to the CVM. Maggie and Victoria would never have come together had it not been for the CVM’s Mobile Hospital. Faculty and students working on the mobile hospital regularly travel around the state to rural animal shelters and rescue programs providing veterinary services to a segment of the animal population that would not otherwise have access to care, thereby improving the adoption potential of those pets. In addition, the CVM’s outreach efforts include responding during animal emergencies in North Carolina and across the United States. It also provides students with training to officially assist emergency responders in the event of a disaster. In the wake of storms like hurricanes Floyd and Katrina, the CVM has provided care and housing for displaced animals. Riggs is grateful for the results of their work. “Maggie was so spunky. When I was 20 she was about 16 or 17 and people still thought she was a puppy. She would run in circles and was just so high energy. She loved greeting people and belly rubs. She was my best friend and a once-in-a-lifetime dog,” she says. It wasn’t until this year that time finally began to take its toll on Maggie, and she finally succumbed to the inevitable. But even in her final days she helped the CVM community that had rescued her, as Riggs made her available to participate in a research study on the eyes of subjects recently diagnosed with Cushing’s disease, a disorder of the endocrine system often found in older dogs. Such individuals are prone to Sudden Acquired Retinal Degeneration Syndrome (SARDS). While Maggie had a long and wonderful life, many animals were not as fortunate during Hurricane Floyd. In addition to the toll on human life and property, especially in rural communities, the flooding killed nearly 3 million chickens and turkeys and more than 30,000 hogs. That’s why NC State’s Mobile Hospital team was on duty in eastern North Carolina to save as many companion animals as possible from the devastation. And that’s why they will be there this hurricane season if disaster strikes again.